About a year ago Natalie asked me to make a small quilt with her new fabrics debuting at spring market. 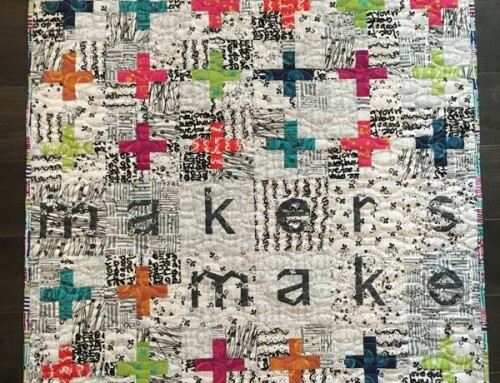 Hand Maker is Natalie’s first collection for Windham fabrics and I love the group! I am here today to tell you that not everything goes to plan in my studio. I had designed and sewed two tops, and decided neither of them really showed off the fabrics as much as I wanted them too, working with a limited supply of fabric, and time, I decided to improvise my blocks. I cut up the tops into small chunks and added to them until I had 25 blocks each trimmed to 6 1/2″ square, and a 30″ quilt top. As much as I love this piece, this is not the way I usually work! Usually I plan, and calculate everything before I ever get to fabric, but working on the improvised blocks is so freeing and fun. I love that some of them are straight, and others are obviously wonky, it adds to the overall “charm” of the quilt. To unify all the angles and movement in the top, I quilted it with 1″ circles. I did this with the Prostitcher on my long arm, let you think I’m that much of a perfectionist! So, do you have a quilt top in fabrics that you love, but a design that isn’t all that exciting? I challenge you to chop it up, try something new, something that excites you and your creativity again! Natalie has a Hand Maker bundle for one of you! Tell me in the comments about your improvising experience, and I’ll select a winner next Monday, December 12th. I haven’t done much improv. I have chopped up some nine patch blocks to make a disappearing nine patch and that was fun. Maybe I will try your suggestion for chopping something up and putting it back together another way. That could be fun and actually I have a few orphan blocks I could start with. I’ve just gotten a couple of improv blocks done. I wish I could express in words how out of my comfort zone this is taking me! Lol! Can’t wait to get more blocks done so I can see where this will end up! I have not done improv. I have a friend that does and I like what she does. But I am so traditional, not sure I can. There is a little voice telling me , “do it do it you will like it! I’ve made a few improv blocks for bees and 2 imrov quilt tops. I haven’t quilted then yet though, I’m not sure how I want to. I have done several improv quilts…..starting out with no plan and just seeing where I end up. It is fun. I haven’t tried improv but it looks like so much fun! I haven’t done improv… yet. 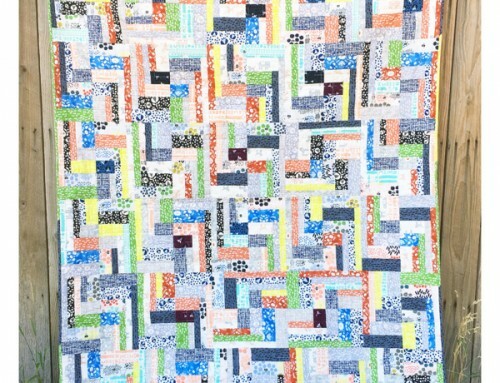 I like to get everything straight… but I enjoy look at wonky quilts made by others. I have to have a plan laid out and study on it for awhile before cutting. Guess that’s why I don’t get many quilts made. Thank you for a great giveaway. I am currently working on bee blocks that require improv and it is so much fun. They are turning out great too. I have not done much improv quilts but I did join in on a mini quilt swap and it was definitely improvisational. I love the experience and want to try more. Thanks for the fantastic giveaway. I am too much of a beginner to get improvising. But I love to read about others in hopes that one day I’ll be doing some. I love cutting blocks and putting them back together in different ways. These fabrics look great, so bright and happy. I am with you on the freeing feeling of improvising. I love to piece my quilt backs with scraps left from the quilt top. I spend hours on the back and sometimes like it more than the front. Love your little quilt. I did an improv square & really liked it! I Turned it into a throw pillow, someday I’d love to do a quilt like it-way different experience to just go for it vs following cutting & pattern experience! I have tried it only once, but would to try it again with less stress. Love the look of the Handmade Quilt you have made. Would love to try it. Thanks! Improv is my favorite style of quilting! I love being able to sew pieces that are irregular and not have to worry about matching seams and making perfect lines. It’s such a great way to be creative and let my mind go free while stitching! Hi no I haven’t done any improvisational piecing, I always use patterns and then design it to my liking. I don’t improvise much! 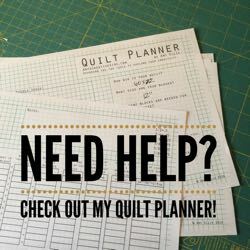 But I recently quilted a lap quilt in a continuous line 1/4″ from an inside seam that would hit the outside seam of the next side so it spiraled through the quilt. It was a small step for most but a big leap for a beginner like me! Thanks for the chance to win and for sharing your awesome circles! I’ve done some improv with scrap strips. Sewing them up and cutting into HSTs and sewing back together. Made them into pot holders for all my friends and family last year with bits of Christmas fabric. Thanks! I’ve just started on Square Diamonds quilt blocks (method by Red Hart Quilts) using a Easter egg fabric I bought on clearance and I’ve not found another way to use it yet. I do mostly planned improv — i hsve a general plan in mind but not specific fabric placement. I pick fabrics as I go from a big pile I pulled from stash. Fun and gets the creative juices flowing for me. Thanks for the giveaway! I think it speaks to the kind of friend that Natalie must be, that she inspires a dedication that would have you piecing three quilt tops! And that much devotion pays off in something you love. Would love to try something different with this beautiful fabric bundle So often I sew a quilt with a specific pattern in mind. I would love to have fabric just to create with. That would be so fun. Thank you for this,opportunity . I’ve only made one improve quilt, a christmas tree mat. I’m finishing up a top I started in Sherrilynn Woods’ “get your wedge curve on” workshop, have been happily sewing the scraps from two quilt alongs into little slabs to be arranged into tops and look forward to trying more ,cut and sew as you go’ projects next year. Love this fabric collection! I made a slash type quilt for my grandson. It was so much fun. I would love to make another one. I am a fan of crazy quilts and think this chopped concept is imaginative and liberating!! HI, I HAVE DONE SOME AND LIKE IT! I DO BABY CHARITY QUILTS MOSTLY SO IT CAN BE A CHALLENGE! THANK YOU FOR SHARING! I’m very old so improvising is what we used to call just using all the leftover pieces of fabric. Nothing ever went to waste no matter how small it was. Sometimes we had real works of art, sometimes it was a mess. It was always fun and practical. I’m not a huge fan of improv but I did recently make autumn placemats from leftover blocks, strips, & bits from two of Sandy Gervais’ fall lines. They turned out great and the process was actually fun. May have to try it again! My experience with improve has been trying to ‘make fabric’ from small pieces, but I can’t seem to nail down not introducing curve to the seams or not using long enough pieces. But I see seeeewww many beautiful improve quilts I’m going to give it another go with larger fabric pieces and similar color groupings. Thanks for the giveaway chance! working on a script from Sherri Lynn Wood…..
I’m nor great at improv as I like things to be “perfect”…as if I could ever succeed at that! But I’m always amazed at the creative projects that come from improv. Maybe I need to drink a glass of wine and then sew. I have none. I’m actually in the process of finding a new hobby. My lifestyle is about to change and I’ll hope to have lots of free time to express my artistic side. I am a new quilter so I have not done much improv! I actually just watched a tutorial on quilting as you go along so I was going to improv using that technique by making a table runner. Thanks for the giveaway opportunity! The first quilt I ever made was improv, and it was full sized. I have only made some improv minis since then. It’s about time for another! In the worst way possible, most of my quilting is somewhat improv…I’m a very poor planner and start with a pattern and then fly wild. Sometimes it works, sometimes it doesn’t. I am working on an improv piece using fabrics by Jen Kingwell. My problem is that I keep trying to make it more symmetrical, rather than letting it be. That is the hardest part for me. I haven’t done a lot of improvisational quilting but a few months ago I used a layer cake to make the dissapearing nine patch. When I had it up on my design board I didn’t really like the way the design and colors looked so I cut up the blocks and added some solid strips in places that I thought looked better and VOILA it worked! It was FUN! Do string blocks and mix up all kids of fabric but want to do the wonky blocks….need to be brave! I am going to give improv a go after christmas, I have too many gifts to sew right now, but I have wanting to make a quilt. Unfortunately, I am not an incredibly accurate quilter. I try hard but despite how I measure and trim, my blocks are seldom all the same size. SO I do a lot of improv quilt tops. Sometimes I just go with the flow and while things end up a bit wonky, they are generally the tops I like best. I’m kinda that way with my long arming too. So I say to myself, “This is a practice quilt. One day I’ll get it all together.”And that helps. Thanks. I chopped up some Periwinkle blocks that were all wavy and wonky. This was before I learned to use starch on pieces with bias edges. After I sewed them back together, the end result was magical. They look like prisms. I love the vibrancy and unexpected color combinations of this line. Beautiful. I did some improv work (for the first time!) in the Gwennie Medallion Quiltalong I participated in this year. It was hard for me to throw rulers to the wind and just jump in, but I really enjoyed the process! I have not done any improv quilting, but think it is about time to start trying it. Hmm….improvising…I take my small scraps and just sew them together any which way and then square up a block and when I have several sew them together with sashing in between. Comes out pretty nice. I love to play with improv quilting. I took the Craftsy “Pattern Free Quilt-making” class and made a quilt using the Fantasy Four Patch technique. I also frequently free hand create and cut shapes for appliqué and have used improv quilting on many more projects. Oh, how I would love to win these fabrics! I have chopped up some hankies and made a hanky panky block for my brother and sister-in-law’s 50th anniversary quilt. I have also cut up and inserted little strips of fabric to make little sticks in a block, no pattern, just cut and sew. And have made disappearing nine patch and four patch blocks. These fabrics are great! A girl can never have too many fabrics in her stash! I just finished a quilt made from my own photograph. I had to improvise on certain elements of the photograph, and I got stuck…for 5 1/2 years! Finally finished it yesterday. I adore improve style quilts and love the process.. but I love that you did the circles as the quilting… I would tend to straightline quilt that piece and the circles are divine! I’ve been in a block-exchange where we did improv wonky stars, and for a bee challenge, I’ve taken a yard of military themed fabric, cut it up to showcase the large-scale print, then had to add fabric to make them all fit together into a rectangular top. It was a really fun challenge! That’s the extent of my improv experience. I’ve learned that I have to be pushed a bit to do it, but that I end up enjoying it! I love improv! These fabrics are so gorgeous! They would be the perfect platform to JUMP into an improv quilt. I have done a few small projects using improv. I think starting small give you more freedom to go with what is inspiring you. If you are not making a large quilt, you are more apt to really let it happen as you go! Haven’t really ventured into the improve realm. But that’s not to say that I am opposed to trying the process someday. My improv was simply combining blocks that I hadn’t seen together before. I have a jelly roll race quilt top that just didn’t come out like I envisioned. I’ve been debating whether I should chop it up randomly or unpick and reuse the strips. I think I’ll go for the ‘chop it up’ method! Love these bright colours. I have not yet tried making an improvised quilt, but have bought a book about it, and have been reading about the process and idea, on various blogs. It is definitely on my to-do list. Love the look! I’m up to the improv!! and such delicious fabric too!! I have experimented with Improv using Sherri Lynn Wood’s book. 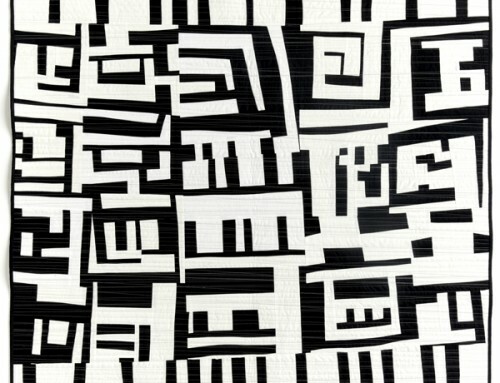 Would like to explore more of this style quilting. I’ve only done a couple of improv quilts, it was fun but also a bit stressful as I like planned piecing better. I tried it last year, drafting my own 3D pattern, still a WIP! I did the same thing you did — started a quilt (in class), took it home, didn’t like the direction in which it was going. So I cut it up and ripped out seams and came up with a design that I still love today. Thanks for the giveaway — I’d LOVE to win this bundle! What beautiful fabrics! Thanks for the chance to win some! I love improv piecing, but haven’t made an entire quilt that way yet. I have done improv on bags, mug rugs, wall hangings, other small projects. It’s a great way to use up scraps and get a bonus project from the leftovers of a quilt. Natalie’s fabric is so beautiful, and I love the rich colors! I don’t have much experience. I once saw a friend doing a inset curvy improv project and decided to give it a try. It was super fun, I played with one and made one a gift for my father. My guild was given a challenge to use our initials to pick 3 colors starting with the same letter as our initials, and then make something with fabrics in those colors. I started off making a lap sized quilt, and ended up with a king sized one, after several more trips to the quilt shop.. It is still my favorite quilt on my bed. I have been putting aside scraps for an improv quilt and have lots of scraps, but starting is intimidating. It’s like I think all the material should be from one designer so it all matches……well, one of these days! I’ve made an improv pin cushion, it was kinda scary and really fun at the same time! I feel like I’m usually improvising — making adjustments and changes to create patterns I like — but it’s not the modern “improv” that quilters speak of now. Most blocks/quilts are patterns I created rather than putting fabric together in a random way. Thanks for sharing about these fabrics and for the giveaway. Most of my improvisation is to fix a mistake! I love doing freeform, improv. logcabins and wonky stars and flying geese. I think my favorite improve piece is a log cabin that I did with Gwen Marston. It was so freeing not to have to worry about exact lines or matching. I tried to keep it interesting by unifying some elements (darker centers for example) so that it wouldn’t look too random. 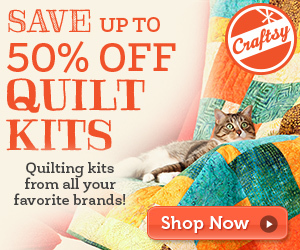 Well, I don’t have any improvisational quilting experience! Your MSQC pattern would be perfect for a first attempt at it! My improve usually happens with small projects, like table runners. I pick out a focal fabric, decide on a color story, find a Pinterest inspiration for a layout and just cut and piece until I have a size that works, changing the layout as needed. Well, I have to say I have an improv “monster” hiding in with my stash…trying to decide whether to make it’s way out and be something…I’m thinking after the first of the year, when my sewing is back to more slower-paced and I don’t have so many irons in the fire….that would be a great time to give it another look with fresh eyes, thoughts and attitude. It’s something I really want to do but I’m so “everything has to line up” that I start to implode when the wonkiness gets to be too much. Crazy me!!! 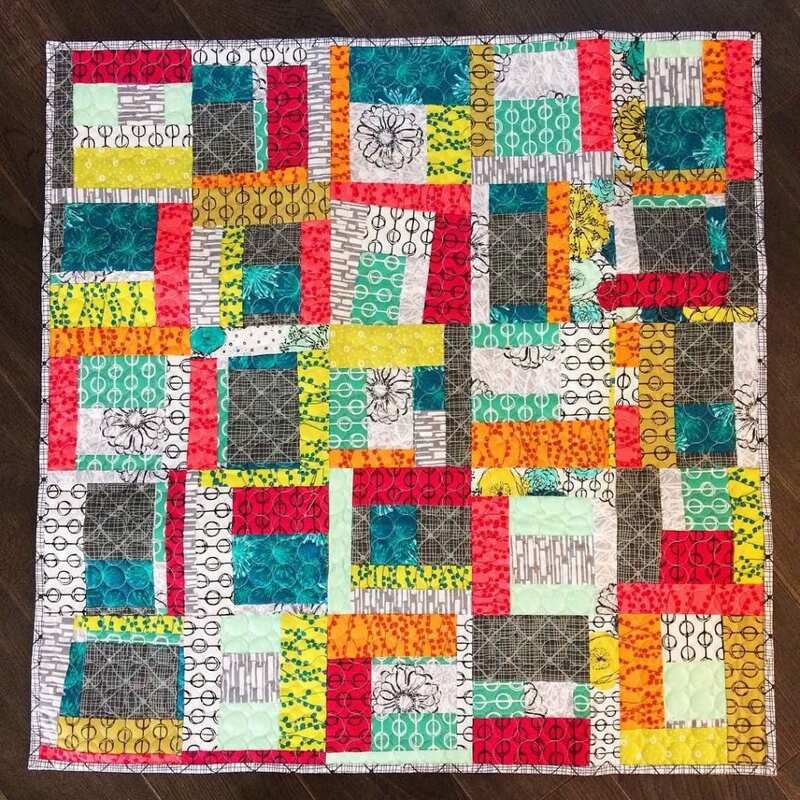 Improv isn’t really my thing, but I did make a jelly roll race quilt once and then cut it up into blocks and sewed them back into a quilt top. I didn’t like the stripey look of the first version. I’ve never tried improv! It’s on my 2017 to-do list though! Thanks for the chance to win! I have a baby quilt size improv of batiks that I have a love/hate relationship with. It sits in my pile of UFOs. I keep hearing a little voice in my head telling me to cut it up. Maybe I should listen, so I’m letting some ideas brew. That bundle of fabric is gorgeous! I have only really done one improv “block”- it was the cover to a fabric book for a baby. I loved how it turned out, and hope to improv again soon! I’m an improviser all the time. I work with a lot of scraps and love playing with them to put together beautiful quilts. But it would be fantastic to tackle a quilt with this bundle!! I wanted to make a pillow for my son using some Pandalicious. I didn’t really have a pattern in mind but I knew that I had a great piece of fabric that I wanted to feature. So i just started with that and built around it. It is somewhat an untraditional log cabin block but I love it! He will too, I hope! Thanks for the chance to win this great fabric Amy!! I love doing improv! I have done many projects. Taking little bits of scraps and sewing them back together to make something new is so much fun. I can’t get myself to do improv quilting. I need to think on it and plan my projects because I like to see what I’m getting myself into. Love your quilt, and the quilting is perfect. So I tried my hand at an improv quilt. I didn’t much care for it until I quilted it. Now it is one of my favorites. I guess the closest I’ve come is sewing wonky strips on a string quilt. What a gorgeous quilt you made! Such great fabrics too. I have only made improv bee blocks and I find it tricky to step away from the ruler! I am more of a pattern follower but improvised a wall hanging in kaffe fassett fabric challenge in my guild. It turned out to be one of my favorite projects to my surprise. It was a wild Dresden plate in colors and patterns that were completely me. Ilook forward to doing something similar, again. I’ve never done improv. I love it, but I’m afraid it would come out as a big mess if I tried. SOMEDAY I’ll be brave enough, I’m sure. My favorite improv was — I had a dozen small blocks from an abandoned project; laid them out on the design wall in a sort of squared spiral, and then figured out how to fill in the background with something neutral. It made a great baby quilt! I had made a quilt using stripe fabrics and had pieces left over that were cut at different angles. I decided it didn’t matter if the right or wrong sides were put together because the shades weren’t that different. I then squared them up to different sizes. I have yet to put them together but I have the blocks done. I’ve done some improv. I also have been known to find an old project in progress and cut it up and add on until I like it better. Saves me from one more work in progress and is creative. I love the process of projects and so sometimes I am happy to experiment with the process and not continue to finish the project. Thanks for the giveaway. Love the circle quilting. I made an improvisational piece, and I love it now, but it took me several hours to get started and figure out how to proceed. Not my favorite way to work either. My improvisation usually involves adding applique or changing the size of the object and so on. However, you have inspired me to try chopping and rearranging a huge quilt top made by one of my grandmothers. I keep thinking I must quilt it; but since I don’t really love it as is, your idea would be perfect. It would retain the work of my grandmother, but I could make the changes it needs to make me love it! Thank you!! I wanted my batiks quilt bigger than my blocks made it so i decided on the spot to add sashing between rows! I have 36 6-1/2″ improved blocks I’m doing with hand dyed and hand printed fabrics. I’m also using small amounts of text and plan to use a low volume background to create a minimalist quilt. Slowly it is growing. I work on these blocks as a “break” from other quilt projects. I took a pile of leftover blocks from my last bed size quilt – cut them up and rearranged them and made a miniquilt! Really liked how it turned out!! Inspiring me to try it more often! Sometimes improv works out! I’ve only really done a few small improv pieces, and I’ve found they sure turn out better when I go minimal, because I start adding too many colors and prints and it goes a bit bonkers! Thank you for the giveaway! I loved working on the improv “Gee’s Bend” quilt I made…except that one of the fabrics didn’t work with the rest. It made me unhappy with the final product. I will try again! I made my first improv quilt last month and really enjoyed it. I think I’ll try again in the future. I have mostly done some “planned improv,” where I have a general plan but choose fabrics as I go from a pile pulled from stash. It’s just random enough to get my creative juices flowing. Thanks for this giveaway! Such beautiful fabrics! I’ve made a number of improv quilts, I love it! I’ve done a little improv, mostly based on a log cabin or Crumb blocks. Live the fabrics and I think your circular quilting is great – reminds me of the Pearl drops fabrics, another favourite of mine. I always look at mine and see “not straight” instead of “improvised”. Yes when I see the quilts off others, I love that look. I guess I will have to learn to be a little less demanding on myself! I have never done any improvising unless you count crazy quilting or just randomly sewing together some scraps into a larger piece of fabric. I haven’t done any improv blocks, yet. But have it in mind for the future. Like the way your quilt came out. I haven’t done a ton of improvising, I would like to though. I’m still not sure I can let loose enough but I may try someday! I have just started quilting and so have gone by the book, but this is spires me to play around with what I have! I’ve never done improv blocks before but I always have designed my own quilts except for a mystery quilt last year. I’ve done a little improvising. I do like your idea of chopping up a top & starting again. I’ve got a top that I just may try that on. I finished it several months ago, but haven’t been too happy with it, so I have never quilted it. Thank you for the suggestion. Most of my quilts are improvised to some extent. I enjoy the idea of composing a design, selecting the fabrics, and making the parts that I eventually make fit together. I almost never know what the final design will be but enjoy the process of making it up as I go. I LOVE string quilts — they are my go-to projects when I want to do something but don’t have another idea in mind. I love your new project and congratulate you on stepping out of your comfort zone! I’m slowly working on a improvised quilt for my husband’s cousin and her 3 kids. A couple of summers ago she brought me an old quilt her mom had made her out of her old baby clothes. We took that quilt apart and I saved what pieces I could and we added her 3 children’s baby clothes to the mix. I also added in some of my in-laws (her aunt and uncle) shirts. I did a few improvised blocks, just adding in all these crazy shaped cut up clothes. I only got about 5 blocks done, and then set the project aside for some paying work. I just couldn’t get back into the project, it wasn’t calling to me…then sadly, a couple days after Christmas, her brother passed away. It absolutely devistated her and her kids, along with my family. She packed up a bunch of his clothes and sent them to me, to add into the quilt. But I still couldn’t get into the project….Then 6 months later, her mother passed away also. So what was going to be a quilt for just her and her daughter has now become 4 memory quilts. I’m doing the blocks in 12.5′ quilt as you go blocks, and will be attaching the rows together using the kids’ old baby blankets. I’m so happy to have a part in helping bring my family some comfort after all the heartbreaks. My improv is usually associated with fabric choices – I rarely use a single fabric line but integrate anything and everything from my stash – love the surprise element. Had a go at crazy patch many years ago and just couldn’t do it for some reason. Maybe my improv piecing mojo will surface one day. Hope so. I’ve done a little bit of improv piecing, but not much. I love it, though, and would like to get back to some of the projects I’ve started. I did a class with Victoria Finley Wolfe, but she called it making fabric. Loving improve in any form but I also love to “collect” patterns. Thanks for a great giveaway! I usually follow directions to a tee. I don’t veer from a recipe. You make improvising look easy and beautiful! Great work! I like to think I like improv but really it’s hard for me. I feel like I end up wasting a lot of fabric. I am new at quilting so I haven’t done any improv. I’m too scared of messing up too much. But I like the way this looks so maybe I’ll give it a try soon. I have only made a few small improv pieces – not a quilt yet but I’ve got a few ideas that I’d love to try when I’ve got some time. Love the quilt you made and the quilting is wonderful too. I have an improv 9-patch that I use every so often when I just want to play with a fabric/color combination — I’ve used it four or five times so far. I wonder if that means it’s not improv work any more??! I’ve not done improv, unless you can count stack and wack! I’m a little too OCD to try. the fabric collection, however, is beautiful!! The collection is wonderful, it would be awesome to win it. I have more improv projects in mind than completed, including curves, but really enjoyed making crazy-quilt type blocks from color-coordinated scraps. Still want to make more; as a born recycler I’ve always loved making something great out of nothing. Would love to win this pretty bundle to play with. 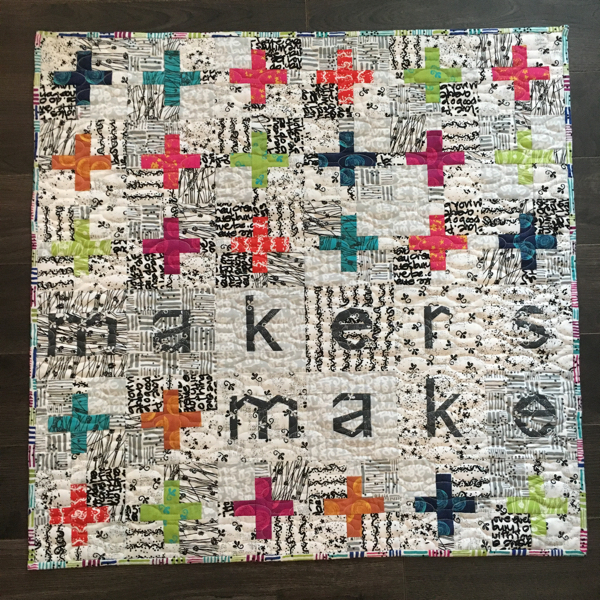 I have always just done quilts ‘m way’ I never took a class and love to design my own quilts they’re so much fun that way….I never know how they’re really going to turn out until they’re done!! I recently have gone from hand quilting to quilting by machine, wow what a challenge it has been!!! Circles are fun, crazy shapes even more so but what I really love is doing animals …hidden in the quilt…..fun!!! I’ve been quilting for several years now. Intricate piecing or appliqué or Y seam no problem but when I try improv that right brain kicks in and I am rarely satisfied with my results. Maybe if I worked with a family of fabrics instead of my scraps I’d have better luck. If I win I promise to post pics of the result. I am working on my first improv quilt right now. I just love it; the process and the results. I will definitely try it again and would sure love to try your fabrics. They’re beautiful. Please consider me. Thank you. I would like to make an improv quilt. I find them most attractive. Just have to get over my fear of doing something new! I would love to win these fabrics to use for this new experience! I’m a pretty new quilter so I’m still in the “following the pattern” mindset. I think improv would be fun. I’m looking forward to trying it. Many thanks!! I have just begun to test the improv waters during the past year. It can be very painful and yet so satisfying! I love improvising. No mistakes possible. I try to use fabric at the end of each project so I don’t get a big war chest of scraps. Usually the second quilt is small. It can be used for a baby gift. I love nothing better than beginning with a square and framing it in improvised strips surrounding it. There is just something about working in that manner that is so freeing! I love it. This fabric is really great! I’ve done a couple of mystery quilts that challenged me. Since I didn’t know what step was coming up next, I took ,ore risks with color, etc. Hi Amy! I’ve never improvised in the way you did for that cute quilt. I do sometimes make things up as I go along, so I guess that’s improvising. Today I decided to make economy blocks to jazz up a border on a quilt I’m making for my son for Christmas. I guess that’s improvising! Improv is scary! So, no I haven’t done any. :). One day I will because it looks really cool! The closest I’ve come to improv quilting is a couple of mystery quilts and trying some of the disappearing blocks. I guess I’m too structured and improv/wonky gives me chills! Just this week, friends and I got together to sew up projects. One of them had 24 mismatched blocks that she was trimming to the same size. She asked for ideas on how to put them together into groups to make a bigger block and I just loved what happened when I tried it. It was colorful and fantastic to make something amazing out of such crazy combinations. OK, I’m probably going to be the only commenter who has not done an improv quilt of any kind, BUT, I would love to try after the first of the year, when all my Christmas gifts are made and have time to relax. I love improv! Never really had a problem improv quilting…when solids are involved. But…when it comes to using prints, I have a brain freeze! I’ve got a stack of Alison Glass that I am itching to cut up, but I’m afraid to! I feel it has to be a killer design before I take that leap! I truly love English paper piecing and enjoy taking different shapes that fit together, making a bunch of them in different fabrics and colors and then seeing how I can fit them together into a quilt pattern. It’s always a surprise to see how them come together. I love your improv with Hand Maker. My improv was supersizing some blocks in a pattern to make it a bigger quilt for a bigger bed. My Modern guild has been demoing, and encouraging us to do improve all year. But it scares me! I love to plan everything out before even starting. So for the improve challenge, I made 4 improve, abstracted flowers, and set them in a more planned background. It worked really well, and is one of my favorite wall hangings. I would love to try it again with these beautiful fabrics – so inspiring! I have never improvised – guess I am a follower for now. But if I win the fabric, I promise to give it a try! I did an improv quilt and completely finished it before I realized I hated it. I chopped it up and made it into a purse and zipper pouches. It was an awesome way to actually use something that didn’t work the first go around. I love the concept of improv but find myself choosing other methods more often than not. I haven’t done much improv but your beautiful quilt is certainly inspiring me to do it! I love the effect! The combination of this gorgeous fabric, the design, and the quilting is perfect! I recently did just that — had a quilt top I didn’t like, so I cut it in strips, added some sashing, and now I have a sort of coin quilt. I like it much better. These fabrics are very pretty. My first real experience was in a class that my quilt guild presented. I really enjoyed the freedom of making something new that can never to be duplicated again. Love these fabrics! So very many possibilities. Great line. I tired the technique of crosscut X blocks by A Quilters Table for a small group challenge of Alice In Wonderland. Interesting. That’s what I’ve heard so far! The only Improv I do is string piecing. Thanks for the Giveaway! I haven’t done any improv work. I’m too OCD for that. But, I love the way your quilt looks and I love the circles. I haven’t done improv quilts yet but am thinking about doing so. I recently helped a long-time quilter clean and organize her fabulous sewing studio. After finishing, I had fallen heir to many beautiful strips and scraps from her huge stash. I decided to try a string block on a permanent foundation where you cut the first strip a consistent shape and fabric and then improvise on every other piece. TAlk about freeing, and fun, and fast!! I loved it and it will make a colorful and fun quilt. I’m not much of an improver, but I like to throw some wonky angles in smaller projects like placemats sometimes. I’ve done some improv piecing. It’s not what I like doing best. BUT I like free motion quilting improving! Thanks for the generous giveaway. Perhaps if I win I will give it another shot! I have done some “Slice and insert” improve piecing. Used the blocks to make a table runner. Have also done some improve using gentle curves and resewing the pieces back together off kilter. I’ve done very little improv. The closest I’ve come is a qayg lob cabinish quilt for my daughter. I adore your quilt. So cheery! I haven’t done improv piecing in blocks, but I have “winged it” when it came to setting blocks together in a top. I received some blocks to put in to a charity quilt, and they were all different sizes. I had an idea of what I wanted, so I just started sewing and adding fabrics to get the top the size I wanted. I had directional embroidery on some of the blocks which also was a bit of a challenge. In the end it worked out, but I was stressed the whole time I was doing it! Improvising makes me nauseous. I c an’t allow myself the freedom. When I try to make scrap fabric slabs, I find myself looking to make all the blocks similar, I have to sort by color,thickness and then create similar patterns. Can you say Type A? I haven’t done any improve piecing. I do like the look of wonky blocks. With my first attempt at improv, I should ahve turned the rotary mat over, because I could still follow the lines! I like your colorful and wonky quilt. I have a lot of scraps I should use to try an improve quilt. I haven’t tried improv yet but I am being more and more drawn to it. I stumbled into it first at Twin Cities Quilting shop in Roseville MN. She had a display from the improv class that was hung in the shop awaiting display at the state fair. I was intrigued and found that I liked almost every one. I think my first will be a scrappy creation to utilize my scrap bucket and maybe make it more manageable…if thats possible! I plan on an improv after Christmas with my late husbands shirt quilt. Love yours. I like to sew scraps together and make small zip bags up for gifts. I always have a stash of the. And I get the most out of the fabrics I love. I belong to a grip of 5 quilters and we’re often doing our own thing when we get together. Last year we decided to challenge each other with a new skill that everyone might not know. We chose a red, white and blue star fabric for all to use and each had to add our own choice of other fabrics. We also had to each choose a star block that we would demonstrate to the group and each of us would then make our own version. Finally, we were to turn our blocks into something finished (many of us haven’t completed that step yet). The first four chose flying geese, templates, paper piecing, and a specialty ruler. I chose improve piecing, something I had never done before but wanted to try. While most of our group found it daunting, I loved sewing and chopping and sewing some more. We then took our “made” fabric, cut A star shape from it and appliquéd it to a block. I’ll definitely be using improve in a larger project in the future. 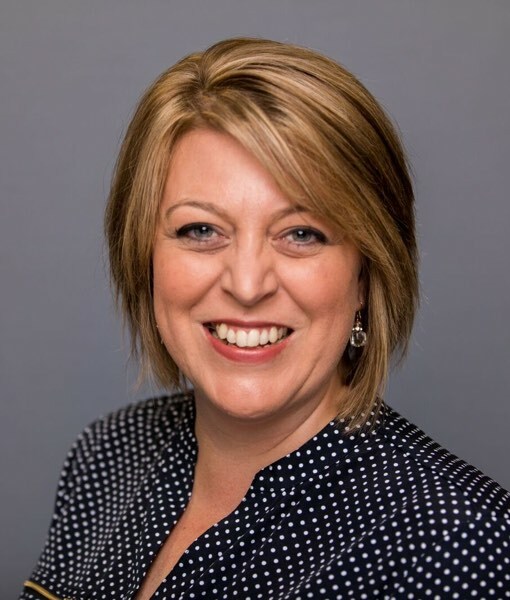 And, if I get stuck I have an expert to go to for help, Casey York is in my STLMQG! I “improv” a lot of my settings , including the QAL from your modern heritage quilt book! I wanted it bigger so I’m making more of everything . I have some wonky log cabins that I am working with right now and I love love love to use scraps and improv to make coasters! The second quilt I ever made was for my son – he had asked for one, which is a big deal. It took me a while to make it and I had stitched non quilt things in bed. I didn’t realize until I started putting blocks in rows that at some point I had changed my quarter inch seam and some blocks were half to 3/4 inches too small! I was devastated. Until I realized I could add borders on 2 sides of those blocks and make it into a design feature! It turned out fabulously and he loved it! I have pieced scraps into slabs and made fabric baskets, and I have dome some curved improv for a bee (yes, just one block). I love your solution and agree the quilt turned out fantastic. I make a few changes but I don’t wing it. Thanks for the chance. When I make bags and pouches I like to improv for a unique look! I like to just grab a piece of copy paper and start paper piecing without a pattern. I just keep adding until it’s the size I need. I make lots of quilts for charity and thought I would have a go at improv using leftover scraps. I saw a Kaffe Fassett quilt with log cabin style blocks but they were rectangular and irregular. The blocks went round each other from the centre out. The design looked great in Kaffe’s fabrics. Not so in my leftover scraps. It didn’t help that I was also trying to stick to reds and browns. I’m definitely a blue-green girl. Needless to say, the quilt – no, make that the couple of blocks I made – is still unfinished in the cupboard. Maybe I’ll get back to it one day. Then again, maybe I won’t!! I’m not sure you’d call it “improv”, but I love hexagons and I love scraps so I am making up my own designs using “scrappy hexagons”! Put the scraps in a bag a pull out to piece. (unless you get same fabric). Love yours thanks. I’ve never made an improv quilt. I have helped a friend make one which was a challenge from her quilt guild. To be honest I’m a bit scared of improv quilting. I have lots of fabric…way too much really so I could risk some and if it was awful it could be thrown out. I think I’m scared of wasting precious sewing time on something that I might not like…….but if I liked it the time would have been well spent. What a dilemma. I’ll have to give myself permission to play and see what happens. I love improv but i’ve never chopped up blocks i’ve already made. I need to try that! I have not done improv; but it sounds interesting. Maybe I can give it a try. Thank you. I have donated or gifted all the quilts I’ve made, so I’ve never been tempted to cut up any of the tops I’ve sewn. I can’t imagine doing that!! The very first piecing I ever did was totally improvisational and made out of my old blue jeans. That was over 40 years ago. Since I hadn’t heard of the concept of blocks, I eventually pieced myself into a corner I couldn’t get out of and so it remains my oldest WIP. I am always improvising. I tinker with a block design, a quilt patterns, an adaptation of something I’ve seen. To me that is part of the soul of quilting. I am a newbie and started as a way to pass time after a bad accident. I have found that constant pain and the ability to concentrate do no mesh so things are not progressing as I had thought. Still trying. I was lucky enough to take an improv workshop with Jaquie Ghering. Although I didn’t love my finished blocks, I did embrace the new experience of diving in without a net! I participated in an online rail fence block swap some time ago. I had lots and lots of rail fence blocks so I started sewing them into block. I had made several blocks and wasn’t really feeling the too many different fabrics together. So away the project went into a storage baggie for several years. I found those blocks one day and still wasn’t feeling the mish mash of fabrics. So I unpicked all of the sewn block units, cut some additional modern print fabric strips including plenty of low volumes and I made three offset bar quilts. When you mix up pretty bright fabric strips with some drab ones, it turns the whole quilt into a happy place. With quilting, it is really hard to tell the not so pretty fabrics. My recent improv moment. I actually just finished my very first improv quilt! I had a pile of 5″ squares cut from various scraps, and laid them out in a big heart shape with a white background. The math was a little tricky for the white pieces, but it turned out just fine. I’m pretty proud of myself! I am not an improve quilter; not yet, anyway! I haven’t tried Improv quilting but it looks like a lot of fun, especially with those lovely fabrics! Some years ago I was sewing for a charity that had given me fabric that had been donated to them, so I wanted to get the most out of it for them. The items were to sell at their Christmas Bazaar – after I had made quite a few things I had lots of Christmas fabric scraps of all shapes left over, and I thought why not sew them altogether to make ‘fabric’ to make something else. It was the most fun I had had for a while, and I cut out dozens of little xmas stockings about 6″ long and stitched on white ric rac trim around the top and made a hanging loop with it too. They were so sweet and sold immediately, and I felt that I had done my best for the charity. I love improv sewing. I like your improv quilt for these fabrics. I haven’t done much improv piecing, mainly on quilt backs. There are just too many quilt patterns that I want to make and not enough time! I have made a few small improv projects like potholders and pouches, but not a whole quilt, yet. I would love to get the courage to one day chop up a top I am not completely satisfied with and then sew it together again. Who knows, maybe this would be a masterpiece! I tried commenting earlier in the day and it told me I was commenting too fast! Say what??? So, I’m trying again. I haven’t done any improv quilts. I mostly work with Log Cabins. Although, I did do a wall hanging using jeans zippers to make a sunflower. Does that count? I have made 2 small Improv quilts. I am much more comfortable following a pattern, although I love the look of some Improve. Have only ventured once into an improv project. This was fun but I generally do better with a pattern. Lovely fabric! I have made a couple of improvisational pieces. I checked out Gwen Marston’s book, Liberated Quilt Making from my local library for my 1st try & loved being free. I also took a class from Jean Wells a few years ago & enjoyed her process. Great post! I’m the queen of researching a project to death so I have a clear idea of what I want to make, then I go into the fabric cupboard and the finished item ends up completely different! I don’t improvise well. The only improvising that happens is if what I end up with is different than it was in my head because I screwed something up. I like what you ended up with though. Thanks for the opportunity to win. I’ve only done one small improv block for a swap. I have to revisit the block. I love that if I don’t have a large enough piece of fabric for the block that it is ok to sew on extra fabric to make it the size I need then add it to the block. After you add your quilting it will most likely be hidden and no one will ever know. I’m pretty new to quilting and have not done any improvising, but look forward to doing some. Lovely fabrics. The only improve I have done was pillows, but seeing your lovely quilt, I would love to try one of my own ! I am currently working on a project that involves some improv. I’m a methodical and logical person most of the time and I am finding that “randomness” is harder than it seems like it should be. It will either get easier as I go (queen size!) or I’ll learn it’s fun to look at and not for me to create. I’m working on an improvised quilt using leftover blocks from a very planned log cabin quilt. So far I’ve cut some blocks in half and quarters, “unsewn” some blocks @ scoured my stash to enhance the color variety. This quilt is for my 4 year old grandson and I will also somehow included incorporate a picture of his puppy. I envision a Ziggy zaggy border around a log cabin framed photo with a bit of eye spy going on. Hope Britton will love to cuddle with his one of a kind quilt. A group of us made a quilt for a Special Person, and I contributed two wonky star blocks. They were very fast and fun to make, but I could use some practice to improve my skill, even with something so simple. I want to try it again. I’ve made a couple of pillow covers in the improve style. I quite enjoyed it, letting colour steal the show. I’ve also taken traditional blocks and set them in an improve fashion; the best of both worlds. I don’t start out doing improv quilts but sometimes they turn out that way. I think a lot of my stuff turns into improv….but not on purpose! But I love the way you approached it thank you for the article and the chance to win some cool fabric! I design my quilts as I go, so I’m constantly improvising as I am sometimes left with odd places to fill in. I get myself into these dilemmas but that’s what I love about doing it that way. It forces me to think outside the usual. When I pull fabrics from my own stash, it is a disaster. Choosing fabrics is the scariest part of quilt making. My only successes are when I use the fabrics the pattern calls for. My first attempt at quilt making (1995) was a nine patch, I used prints and coordinating solids. Was great if you are OCD like me. I have learned to let that go,and if I am having trouble, I ask for help. I almost always need it! Improvising is when I start to make a bag, change the pattern, rearrange the lining, or have to cut out a whole new lining when I sew the top seam, instead of the bottom one, bag the corners, and trim, then find it out too late, sew a new lining without the pockets, and am so happy it looks great in the end. But I think I need to do some blocks with all the strips and scraps I have saved. A flimsy came to mind as soon as I read your challenge. Perhaps I will take a cutter to it! Improv can be scary when you are cutting into new fabrics, but I like the method if I have a bit of a plan first. Thank you for this inspiration! Just did some impov work yesterday! I sewed some strips together in a variety of widths. Thought they would be a quilt the way they were. That wasn’t working for me, so I cut up the strip set and created one large star with the pieces! Now I like it!!! I have done small improv things, but never a whole quilt! My one attempt is still in a box waiting for me to decide ‘what next?’ LOL Thanks for the fun! I’ve been trying to make wonky log cabins as inspired by Gwen Marsden. Some are a little less wonky than others. It’s hard to let go. I have never done anything improve – but I do admire people who have and their projects. Thanks! Have done a lil bit not improve with my daughter…was fun! But haven’t tried since. . Thank you for chance to win your give-a-way!! I do a lot of improv because I work with what I have. Not one to run to the fabric store for more or the perfect fabric. I make what I have work. Improv is a struggle for me. It’s too much puzzling for me when I try to put it all together. It’s fun up until that part! Oy-yoy-yoy!! Thanks for the opportunity to win such a cheery stack of fabric! I’ve done some improve on blocklotto.com, but it’snot my usual style. I always try to put something exrta and my own to all quilts I make and have made, even then when i am using someone elses pattern. The best thing making quilts is designing them. I just love love love playing with the bright colour fabrics and funny modern patterns. I found a partly don quilt topI have no memory of working on it, no pattern, no scraps but I know from the choice of bright colors and batiks, it is my work. From its location in our storage area and a few other clues, I decided it was one of my chemo therapy quilts. Some things are not even a blur from that period of life. But, a fifteen year survivor, I cherish this quilt. It had large rectangle empty blocks and one fabric has kittens (shadow like images). Not liking the large shapes, my impro was to draw 4 different kittens like those in the fabric. I purchased a purple batik that matched one of the original fabrics. Kittens, about 12 in x12 inches in size were appliqués on each large rectangle. Now, I love my bright (oranges, yellows, purples,etc) adorable kitten I Survived. quilt. Seems like everything is improvised. I start with a picture of a quilt that I like, draw out the pattern, maybe, choose the fabrics, and some extra, never have enough and just go for it. I’ve gotten bindings from a fat quarter and lovely borders from just 1 yard. It’s fun! I haven’t done any improv yet. It would be sooo far out of my comfort zone. Maybe a different zip code even. I need to grow up and give it a try. maybe this beautiful fabric would encourage me to try. The outcome was great! I’m usually a very calculated sewer so it would definitely be out of my comfort zone to cut into two quilts to make a third! Her prints are great! I’m a planner as well, alas, not a very good one. Usually after sewing about 1/3 of a quilt top, it becomes obvious that my measurements were way off. I toss everything in a box, wait a week, take it out again and then “wing it!”. I try not to do too much extra cutting, just a lot of repositioning of what has already been cut or sewn, just moved to a different spot than it was originally intended! Improv is now my “go to” technique. It is so liberating and freeing! I’ve made several improv quilts and with each one I wonder why I don’t make more. I just finished an improv Christmas tree quilt. Improv was so intimidating until I took the plunge and I have to say that after my first one, it’s so relaxing and enjoyable – one of my favorite ways to go now. Love your project! I am completely new to quilting so have done no improve yet, it looks wonderful, fun and very exciting though. My first venture into improv was cutting up a bunch of nine patch blocks and resewing four times. Loved the scrappy effect. Then I started emptying my scrap bin after I finished up a quilt, making blocks from the weirdly shaped bits (there were leftovers from cotton bags and backpacks as well). Then I sewed the blocks into four patches and cut and resewed them again. I’ve done it for times. Now I need to sew nine patches and see if they need more re-constructing! 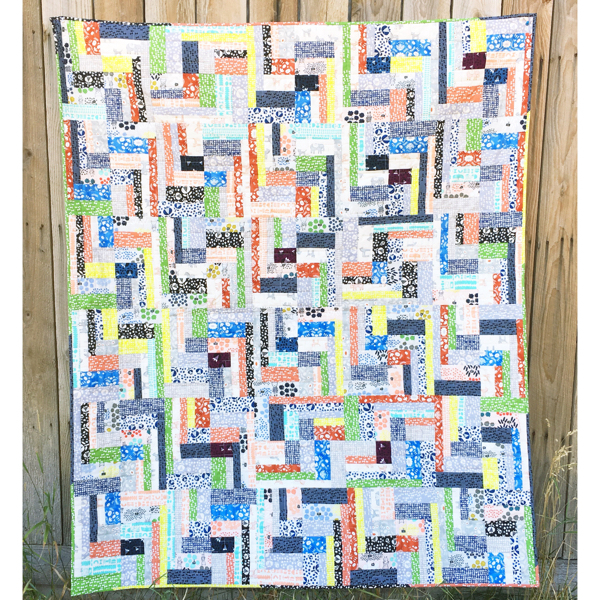 It’s addicting and such a change from the structure of my normal quilts…….so scrappy and unplanned! 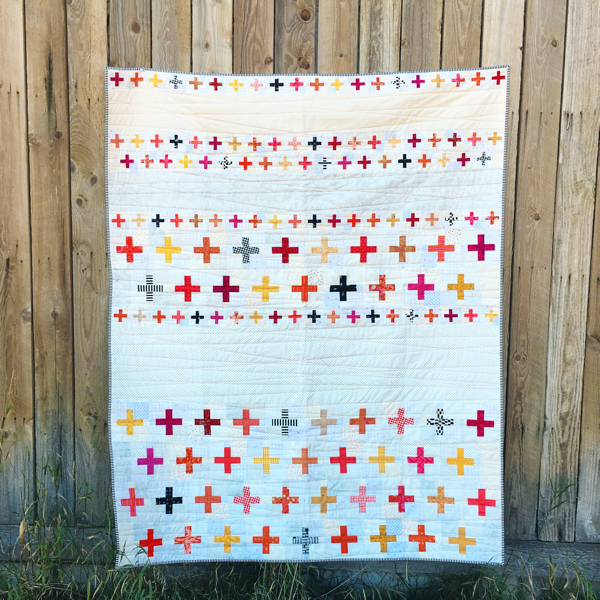 I love your wonky quilt and am drooling over the fabric bundle! Thanks for the chance to win. I have done only a small amount of improv piecing, mostly on potholders. It’s fun to do and I think of it as a warm up to do a bigger improv project. Improv :Mostly pin cushions. I’m practicing w/larger strips now to hone my free motion quilting attempts too. Thank you. I like everything straight and organized (a little OCD lol) and I’m very new to quilting, so I haven’t done any improvisational work…yet. I am still in fear of doing anything much fmq…. I did make a border on a large quilt, free motion quilting around a template. I think I’d like to try using the Golden Threads quilting paper next…..
As a perfectionist I’m loving improv piecing, blocks and quilts. It’s so freeing! 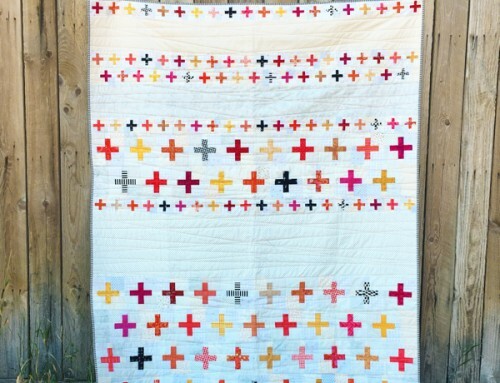 : ) Love the quilt you made with the Hand Maker fabrics! Thanks for the fun giveaway. haven’t done any improv yet – did some wonky square in a square blocks. I love that wonky look but have never had the courage (?) to try it. Thanks so much for this giveaway and all the info you share with us. I’ve done a couple of improvisational quilts so far, one using Lucie Summer’s book as a guide. It has been challenging, but fun, and I plan to try another one soon. I haven’t done improv, per say, but I’ve made a small quilt top off an image I liked. I’m saving scraps to make…something, probably improvised, since I have so many different sizes and shapes. Amy, I love your quilt! I’m a planner too, so I admire your ability to just start chopping up your blocks like that. In my closet…way far back in there…are 2 quilt tops that really need this treatment. I think you have given me the inspiration and the motivation to go dig them out of there and begin cutting. It could be my first truly improv project, unless disappearing pinwheels and disappearing 9patches are considered improv baby steps. ;) Thanks for this fantastic giveaway! That Hand Maker fabric bundle is so pretty! I am new to quilting. I have found a new love. I have improved by sewing various scraps of fabric together to make a “new” piece of fabric. I used it to make a cover for a throw pillow. It turned out darn cute! Thanks for the opportunity to win this gorgeous fabric. I did a black and white improv… knew I wanted the moon to be the star of the quilt, so played with lots of different fabics till I felt like i got the stars and nigt sky in it by cutting up different fabrics! Improv is a very difficult concept for me. Although I like the look of it, I still choose quilt designs that are planned and measured to look like they’re improvised. :-) Thanks for the wonderful giveaway. Love the new fabric line. I adore improvisational piecing! Lately I’ve been sewing all my scrappy bits together as leader and enders … someday it will make a quilt! THanks for the opportunity! Lovely fabric! Hi Amy! I haven’t ventured into any improvisational piecing yet, but I would like to try. The most I have ventured “out of the box” for me is join an art quilt group where we do and discover together, a different technique each month. Thank you for the opportunity to enter your drawing. I have just started using up my scraps to make wonky log cabin blocks. It’s hard for this geometry teacher not to measure and square, but I love what I’ve done so far. I improvised a few times, but color and composition is still challenging! The sketchy designs within the Hand Maker collection will help with composition. Love it, and hope to play with this fabric soon! I’ve been branching out into improvisational quilting lately – trying it with curved piecing and loving how it’s going. I love the new fabric line by Natalie and love her patterns. Thanks for the opportunity to participate in this fun give-a-way! Have not done improve quilting yet but sounds like fun! I’ll probably start with half square triangles first and play with bthem….new to quilting so have to finish my patterns first…..then I’ll hopefully be ready! Lol!! I enjoy improve. Have made a few improve quilts and a couple mug rugs for fun. It is very freeing and each quilt is always unique. I am a bit too OCD to try any improvising in my quilting. Maybe if I start with something small, like mug rugs! What fun! Luscious colors. I’ve done some crazy patch, and string piecing. I have a group I want to try the block that was going around a few months ago. 1′ diagonal, cut crosswise, and the strip of color. Trim blocks, sew together, then cut squares from the ‘new’ piece. Most of my improve is in the machine quilting I am trying to learn! I love improvising! It usually involves straight lines, but no measuring. I find I always learn something about combining colours and prints. Thank you for the giveaway! I love the look of improv but I’m not sure I could bring myself to chop something up!! I’m too new to quilting to be comfortable doing any improvising. Maybe someday! I would say that every time I make a quilt I improvise… sometimes it is intentional and sometimes it is a necessity! I do love making Wonky Log Cabin blocks with my treasured scrap fabrics and have made some beautiful quilted pieces in this method. I need to try to improvise more often. I am becoming more confident in my skills so I guess it’s time to start! In the past most of my improvisation has been creating my own handbags. However I am currently making a quilt for my first grandchild due mid-January, and it has certainly been evolving as it goes. Definitely an improv work in progress. I usually improvise with tools. Very rarely do I use a tool for it’s intended purpose. Rulers make excellent glue spreaders, pins untangle tiny braided wires, clover clips keep piles of pieces stacked neatly. I/m a beginner and I try to improvise with some scraps… at the moment I was only able to do a small mug rug! But I’m proud of it! Never try improv quilts before. Just about every quilt I really enjoy making is one I built on as I worked. Although I do make patterns, I really prefer to develop my own designs. Just started quilting… Every quilt feels like an improve…start with a pattern\idea lines get wonky and on to plan B !! I’m a little nervous about improvising. I tried once and the hubby kept making comments on how it should have been more accurate. It looked messy instead of fun as I see in so many others. 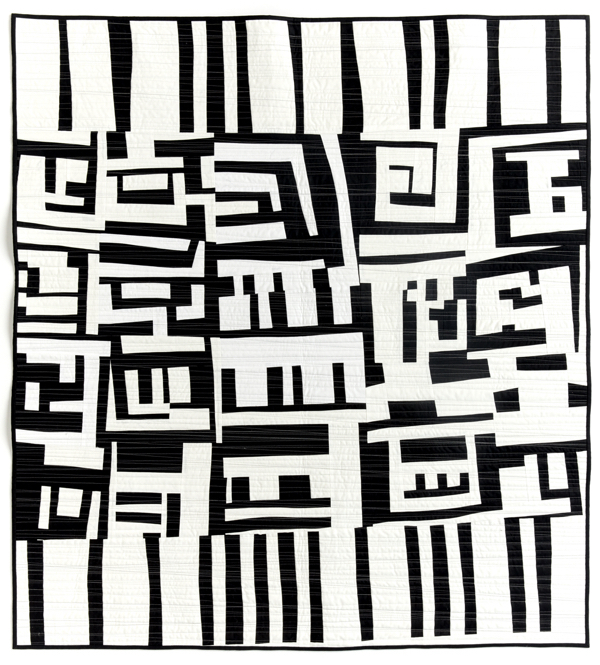 Well, probably one of the first quilts I ever made, when I learned about “squaring up” a quilt block. I got a little to energetic, and ended up having to make a much smaller quilt than originally planned, lol! But, it came out decently, even after having to “improvise” the size of the blocks, after trimming too much away for the sake of squareness! I experiment with improv piecing on the backs of most of my quilts. There is freedom innot worrying too much about the way it turns out because it is the backing. I have really enjoy doing this. OH YES! I do have this quilt that I may cut up. The blocks were in a shoe box for 2 sad years and I needed to put the lattice strips on but could not decide what color they should be. I decided on yellow. WRONG! I ruined it! It is sad again and laying by the wayside until I do something with it……….CUT IT UP and resew is a great idea to make a wonky quilt.